Kodi finaly caught up to his borther and tackeld him. Ha I told you id catch you he said Laughing. Kodi was tired so he lay in the snow and rested. Aleu was walking and she hanged her head. "I know I should not go to hunt alone she said when she heard a strangee but familiar voice.She looked at that way and she saw the ice bridge. "What ,its unpossible! "She yelled. "It can not be. "She slowly started to walk on the ice bridge.Later she was running on it and when se crossed it she throw herself down to the snow."Pfuuuu.... "She said. "It was a little hard and long.She rested a little than she standed up and started to walk to her realy home. Kodi laughed and Sighed so dingo have you seen dad lately? I was thinking about seeing him today. want to come? Nobu stared speechless at Saba, after a while he shook his head and smiled.-"H-hi....I-it's nice to meet you, Saba..." He blushed and quickly turned to Balto. "What?...Oh sure...yeah, that...that would be nice..."
Great Balto said Ill introduce you to my son kodi He is a nice do and Likes to meet new people. IT was hot and sunny.Aleu saw the Bear rock. "Now thats what I search for it. "She said.When she passed through it she finnaly saw the forest of Nome. "Im almost home. "She said. Aleu was walking in the forest, when she saw the first house of Nome.She started to run, when she arrived the end of the forest she went doen to the sea side and quetly walked to her fathers boat. Hello Boys Balto said this is a new friend of ours. He is a bit scared and wnats to make friends His name is Nobu Balto said gestering nobu toward kodi and Dingo. Nobu smiled at Kodi.-"Hi Kodi, thanks...this is a nice place, even though I'm not planing to stay here for a long time. I wasn't planing even to come here...I'm looking for more wolves like me, you know, a pack, to start a family...but...if it's ok with you I could stay a day or two, I've been walking for days and I'm pretty tired, I won't even bother you, I think I'll stay in the beach, it's not a den but...It's pretty much my only option, besides, I've been through worst situations, a few cold nights won't kill me." "Well, I don't know Balto..." - Nobu suddenly remembered hearing a lot of wolves talking about some Balto, but he couldn't remember why, he felt curious about him and why he was so known.-"Tell me, Balto...have we met before?...your name sounds very familiar..."
Nobu smiled at Saba and blushed again, completely ignoring the other dogs talking.-"Well...then... I guess I'll stay on Balto's boat, but...tell me Saba...Are there any interesting places to visit here in Nome?" 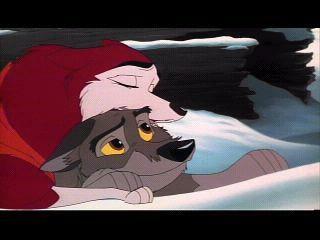 Aleu jumped up her fathers boat and layed a place where she could see anybody, but nobody couls see her. Aleu saw her father and Dingo.She smiled, because they can't saw her. Balto said alright kodi have a good run and see you when you get back. "Yeah have a good time Kodi!" Dingo called after him before whispering so no one but Balto could hear "Well I am not sure how I feel about the whole idea about Nobu and Saba together don't get me wrong he's a nice guy it's just well....I'm not so sure he's her type"
Saba meanwhile smiled at Nobu and replied "Well we can go to the boiler room if you'd like"
Nobu suddenly smelled another strange wolf-dog essence nearby, but this one was much more like a wolf. He quickly looked around trying to find the wolf-dog,but he couldn't see anyone else.He was getting nervous about this misterious wolf-dog, but he felt good with Saba there, so he just ignored the wolfdog,for the moment.-"Sure,I'd love to go to the...boiler room." Alue saw the wolf.She standed up and layed upper on the boat, so everybody could see her. "Well well well.I think dad's got a new friend. "She looked with a big grin in her face.